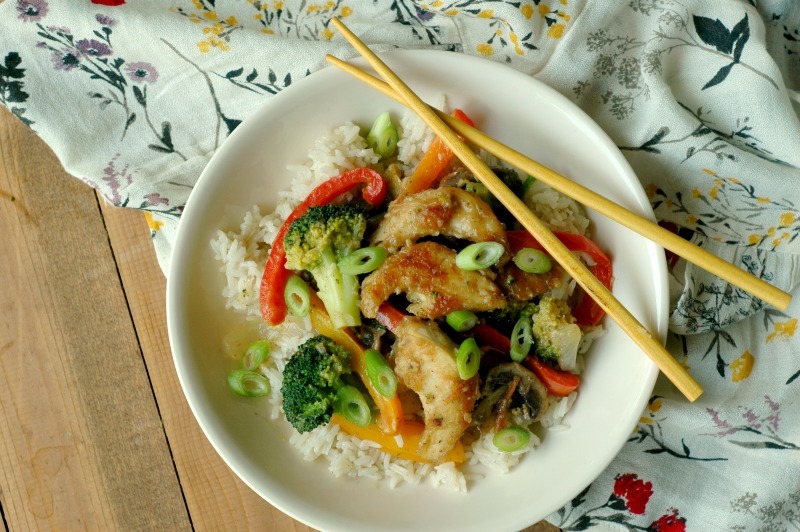 Bone broth packed rice, and crispy chicken in a veggie packed stir fry with a kid friendly flavor! All in 20 minutes! …I think pretty much everyone would admit that most of the week, most families need under 30 minutes of meal prep for dinner time. I thought as my babies got older (read, less needy! ), that I would have more time for all sorts of things. As it turns out, these older kids are pretty fun to do stuff with! 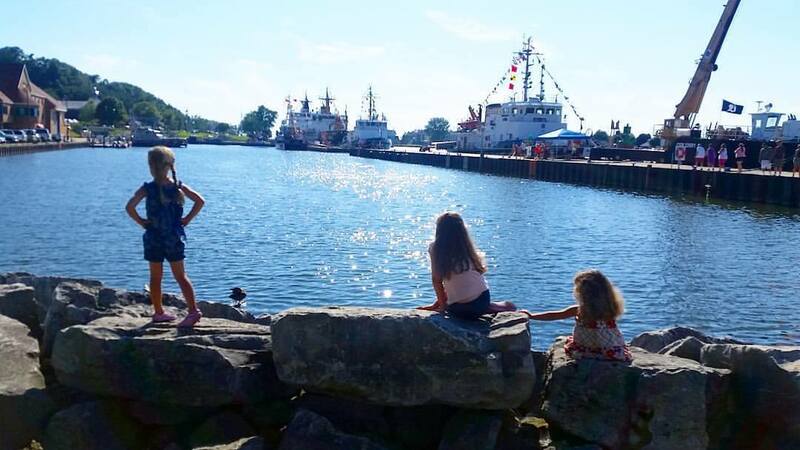 We’ve had the most freedom-filled summer I’ve had in years without babies in diapers, or nursing, nap schedules, and fussy teethers! I’ve been nailing down some of my less than 30 minute dinner ideas for you all, and I hope it helps you as much as it has helped me this summer. Busy families need filling meals that actually count. Not just fillers. My kids are growing like crazy right now, and meals with balanced macros make all the difference not only in their mood, but their sleep and stamina. This dinner is packed with mineral rich vegetables (that actually taste good! ), and energy packed carbohydrates to fuel busy kids. 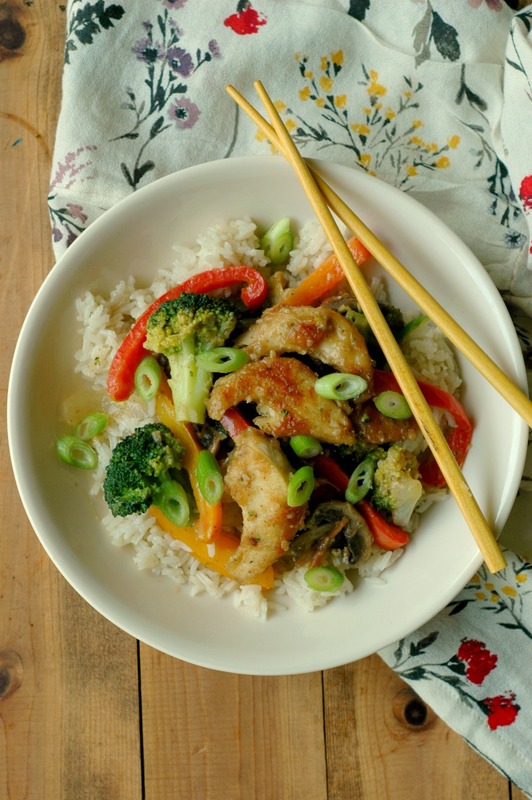 The protein is sourced not only from the chicken, but by infusing the rice with amino acid rich bone broth. This packs a big nutrient dense punch to this meal. Don’t skip out on adding a pat or 2 of butter or ghee to the rice servings – the extra fat will satiate growing appetites, as well as nourish their ever growing brains. My secret to fast, crispy chicken! It looks so fancy doesn’t it?! I’m telling you, dear momma, cooking a whole chicken or two every week and keeping the meat for quick meals like this is my best kept (or not so best kept!) secret. 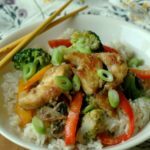 I use my Instant Pot to cook one or two chickens most weeks (if you have a slow cooker, that works just as good and is how I did my chickens for years and years!). Slice up the meat, and stash it away for quick salads, wraps…and meals like this! It just needs a quick dusting of seasoning and starch and it will crisp up in a pan of friendly fat and have the taste and feel of crispy chicken from a restaurant. Definitely get creative and swap out the veggies for what is in season and budget friendly near you. That is one way that you can keep this kind of dinner on your menu rotation every other week and still keep it interesting! 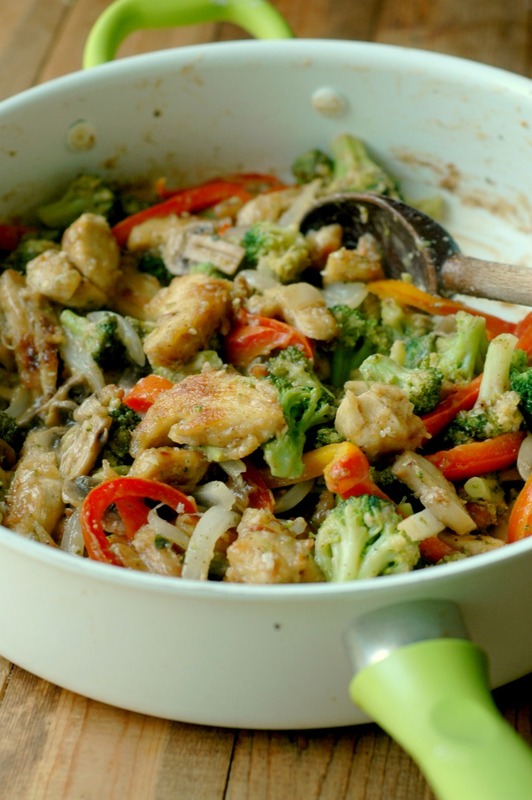 Swap the broccoli and peppers for sugar peas, zucchini, cauliflower, or carrots. You can also add a huge handful of spinach or kale at the end to wilt in for extra veggie power! I do this more often than not and it’s a good way to get a load of green into your family. While this meal literally does just take me 20 minutes to make, I wanted to leave a few tips that will help you make things run super smooth (because dinner prep time of the day can be crazy, right?! ), and shave off even more time. I know some of you have busier schedules than I do, or maybe are a new momma and can’t even imagine taking 20 minutes to do anything but nurse right now 🙂 I get it! Have a prep day. If you have even an hour or 2 each week that you can devote to getting food prepped for the week, you can side step quite a few instructions on any recipe. Your prep day can include making the rice ahead of time – and maybe doubling or tripling it so you have servings of rice for other meals. Chopping vegetables and portioning them off into containers for certain meals. The sauce for this stir fry can even be made up ahead of time so you just have to dump it in. Just whisk it all up and pop it in the fridge til you are ready to use it. And of course, cooking off a chicken or 2 for your meals during the week will help meals go faster. Have the kids help. Good lawd does it feel like prep goes slower with those little guys around – at first! But let me tell you, when I can had my 4 year old the veggies to wash up, and my 8 year old is doing the chopping, that leaves my hands free to get the other stuff ready. It’s worth the training – put ’em to work dear momma! Double up. You can easily double this recipe to feed your family twice in one week. The recipe on it’s own feeds my family of 5 for one dinner, so doubling up will give you a night off cooking if you need it for those days where cooking just isn’t going to happen. 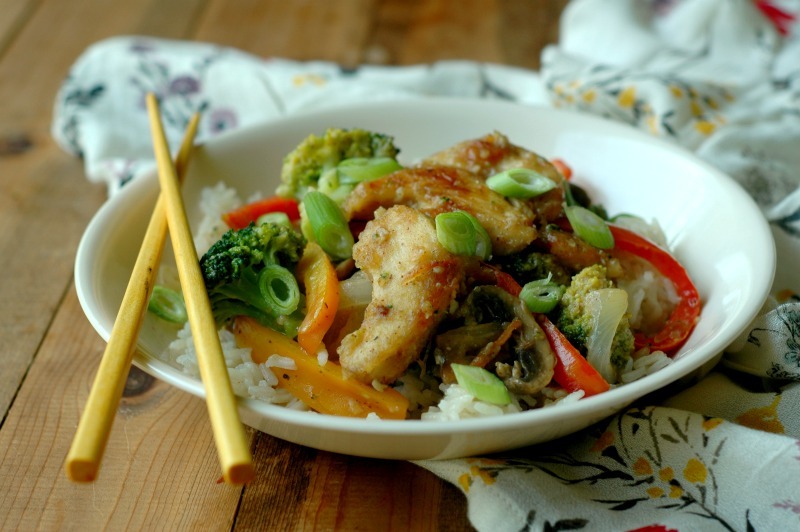 Bone broth packed rice, and crispy chicken in a veggie-packed stir fry with a kid-friendly flavor! All in 20 minutes! Put the bone broth, rice, and ghee in a pot with the lid on. Bring to a low simmer for 15 minutes while you prepare the rest of the meal. When the rice has simmered for 15 minutes and all the bone broth is absorbed, turn the heat off, keep the lid on, and let it rest about 5 minutes, or until you are ready to serve your meal. Put the potato starch, ginger, and salt in a dish and whisk to combine. Toss the chicken in the starch mixture to coat. Heat a large skillet to medium-high heat, melt the ghee, and toss the chicken in. Cook the chicken until golden brown and crispy, stirring occasionally – about 5 minutes. You can prepare the sauce while the chicken cooks. 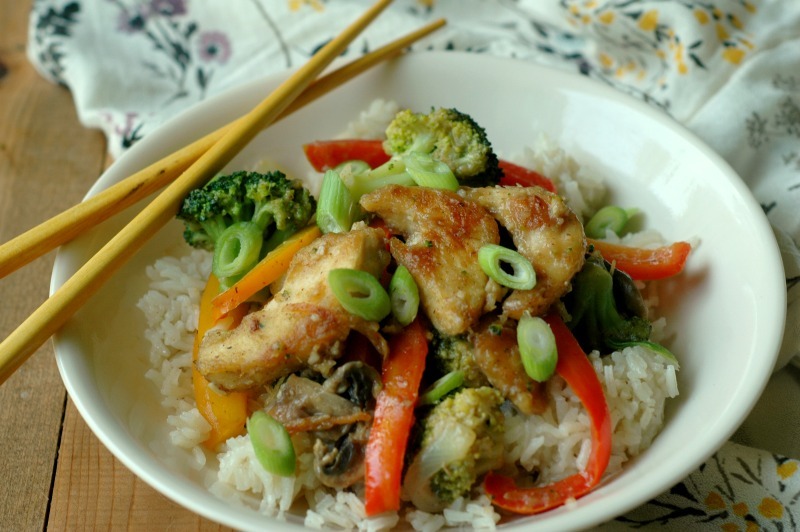 When the chicken is done cooking, set it aside until the stir fry is done. While the chicken crisps up, put the sauce ingredients into a bowl and whisk to combine. Set aside until it is time to pour into the stir fry. Melt the ghee in the large skillet over medium-high heat. Toss all the veggies into the pan with a big pinch of sea salt and cook for 5 minutes until the onions are translucent and the veggies are tender/crisp. Add the crispy chicken and the sauce, stir to combine, and cook about 3 minutes until the sauce thickens (the starch on the chicken will thicken the sauce!). Sea salt and pepper the stir fry to your taste, and serve the stir fry over the bone broth rice. Garnish with green onions if you wish! See above in blog post for Cauli Rice or veggie noodle options if you are grain free! 15 Minute Grain Free Asian Noodles – Lo Mein Copycat! This is my kind of meal!!! Love how quick and easy this comes together. Plus that CRIPSY chicken!!! YUM! This sounds & looks wonderful. I’m absolutely starving now and want those crispy chicken bites! What a fab looking recipe, ideal for a Sunday night casual dinner! Printing this one off for safe keeping! Love quick and delicious meals! Also, I never thought to cook rice in bone broth. I HAVE to try that out! Yummers!!! I absolutely love it’s only 20 mins too! When it comes to rice, cooking it in water is doing a huge disservice, so I love this idea for adding lots of nutrition and flavour to the base. YUM YUM YUM! this recipe looks better than a restaurant! I have been craving rice, and cooking it this way is genius!! This is so perfect, all the best comfort flavors in just 20 minutes! 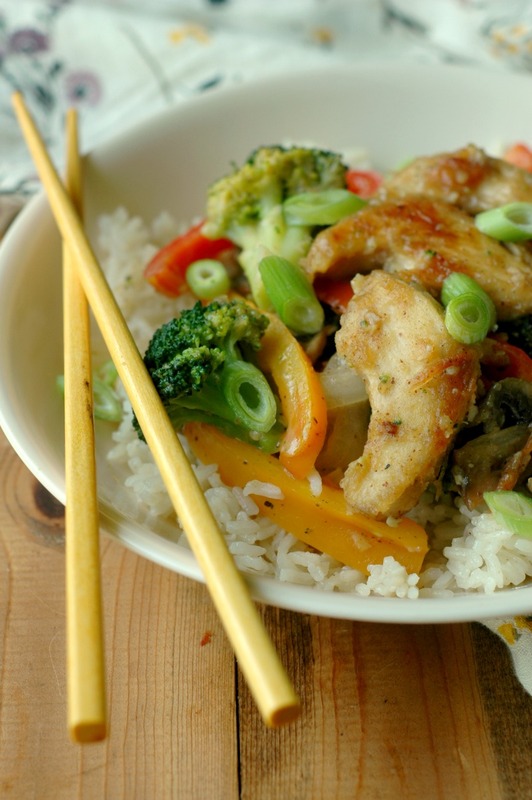 Wow this chicken stir-fry looks SO DELICIOUS !! I can have this everyday ! You had me at 20 minute. Looks delish! This looks delicious and so tasty, what a great idea! Wow! My super picky kids who freak out if there is sauce, breading or anything green in their foods actually ate this. That’s a double bonus because I loved it too. Hooray! Thank you for sharing the recipe! Love that Katie! Thank you for sharing! I was skeptical of the 20 minute promise, but wow- this meal does come together fast! I love and use so many of your recipes. Thanks for another winner! 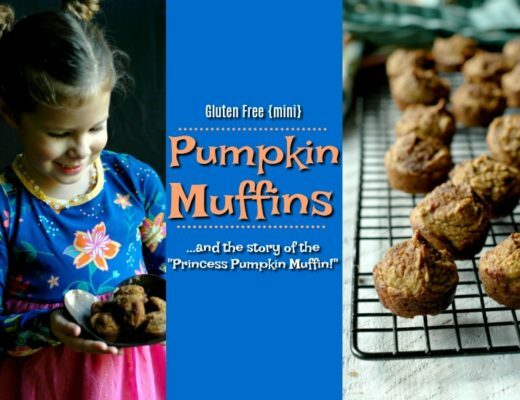 I really appreciate all you do to offer nutritious family-friendly recipes!